Threading Chelsea: Welcome To Unique Threading Salon's Blog! Welcome to Unique Threading Salon’s blog! We are so excited for our clients to learn all about what we do at our salon, and why we love it so much. We are a full-service salon, featuring waxing, threading, massage, and much more. We want to help you feel fabulous and look fierce, which is why we practice all the latest hair removal trends, massage techniques, and body art application. With Unique Threading Salon’s brand new blog we’ll be discussing all things related to our business. We want to educate you on the things we do here, and why they are great services for you to utilize. Threading is our name, and it’s our game. Threading is a hair removal technique that has been around for centuries and it is a superb way to remove unwanted facial hair. It’ super fast, less painful than other methods, and is affordable. Get those fierce eyebrows you see all the movie stars rocking, or remove any unwanted lip hair. This service at our salon is among best in Chelsea! Had a rough day at the office? Not feeling like yourself? Come get an amazing massage by one of our specialists. We prioritize beauty and balance all in one place. Our massage experts are trained to help you relieve tension, stress, tired muscles, and enhance the circulation in your energy channels. This is just the boost you need to live a fulfilling day, any day. We specialize in using an Ayurvedic massage, where oils are used to soothe the body and help calm and balance the body and mind. Our experts have been specifically trained to perform this massage so you will not be disappointed. Are you looking to make a change, but maybe not ready for a permanent one? Come check out awesome henna and eyebrow tinting. Eyebrow tinting can give you the little boost in your look that you have been after. 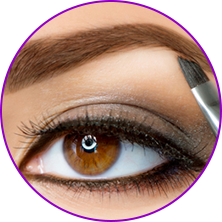 We can enhance your brow color to make it look fuller and more visible, even adding highlights, which add dimension. 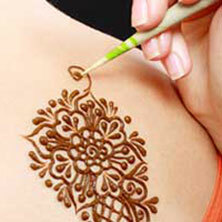 Henna art is a great way to have something fun and unique on your body for a limited amount of time. It is a beautiful art form that has been used for centuries. Have a fun look for at least a week! Traditionally, waxing has been another great way to remove unwanted hair all over the body. Waxing involves taking a wax solution and heating it to a certain degree, then applying it to the skin and hair, and finally pulling the strip to remove the unwanted hair. A newer solution to hair removal is sugar waxing, a less invasive treatment that may cause less pain and irritation. Either way, both are great for the results you are looking for. Unique Threading Salon in Chelsea can be your new go-to destination for all these things and more. Our friendly and professional staff are always willing to help you, and strive to make sure you get the results you were hoping for. Schedule an appointment today, and always check back with our blog for fun facts and information about what we do!